1It is difficult to describe fighting as the narration of military events is always difficult for the reader, who cannot be assumed to have any familiarity with the battle sites. The references to numbered hills sometimes makes the text a little dry, but this system cannot be avoided. On the other hand, these real events cannot be related as if they were fiction; a description of the fighting inevitably constitutes a chronological narrative in which, with the best will in the world, there is little room for lyricism. 2Readers should be aware that it is the acts of the 3rd Battalion that are given most attention at this site. It was the 3rd Battalion that conducted the main offensive at the Belvedere. 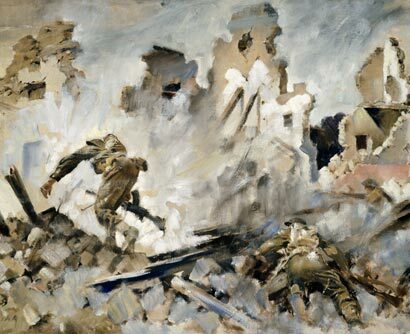 However, the actions of the 1st and 2nd Battalions were also determining and their efforts cannot be considered to be lesser than those of the 3rd Battalion; the 2nd Battalion in particular was totally decimated. In consequence, we have narrated their feats as faithfully as possible on the basis of the information in our possession. However, the books of both General Chambe and General Douceret (the two reference works written after the war on this subject) place more emphasis on the action conducted by the 3rd Battalion. In particular, Major Gandoet and Lieutenant Jordy, as a pair, have an almost central role in the fighting. This is due no doubt to the charismatic personality of the principal witness, Major Gandoet (who has gone down in history as the “man of Belvedere”). Apart from his presence in the theatre of operations, Gandoet, of all the higher ranking officers who survived, was the one who had most to say after the war about the Battle of Belvedere, right up to his death in 1995. With respect to Lieutenant Jordy, General Chambe uses his name in the title of one of the chapters in his book (Chapter 8 – Les braves de Lieutenant Jordy). He was the only officer to receive this distinction and the choice made by the author of “Bataillon du Belvedere” was certainly not due to chance. Indeed, the role of the youngest officer of the 4th R.T.T., who was aged 29 at the time of the action, was key in the breaching of the Gustav Line. Furthermore, having been killed on the day on which the 4th R.T.T. were relieved (see the section “The Relief of Belvedere, 4 February 1944” on this site), Jordy represents all the martyrs of the 4th R.T.T. (the term used by Marshal Juin in “La Campagne d’Italie” when writing of the death of Jordy). This situation should not minimise the no less heroic actions of Tixier, Bouakkaz, El Hadi and of all the other officers and men who died on Italian soil. The action of Captain Tixier, in particular, has an exceptional place in this narrative of the events at Belvedere. Unfortunately, it is impossible to cite the names of all the men involved. As we said before, we hope this site will be enriched by the contributions and testimonies of visitors. 3The following pages are an attempt to summarise the existing books and documents. Gaps remain and this summary is bound to contain mistakes. We hope that visitors will add comments. Thanks to the Internet, this narrative of these feats of arms can be enriched, improved and corrected. This summary is based essentially on the book by General Chambe, and on the logbook of the 3rd Battalion of the 4th R.T.T., which is the basis of Chapter 8 of General Douceret’s book, which was dedicated to Gandoet. The book by Marshal Juin on the Italian campaign (see bibliography) proved to be very useful (particularly on the strategic aspects) as were the writings of Major Gandoet written after the war on the events at Belvedere. 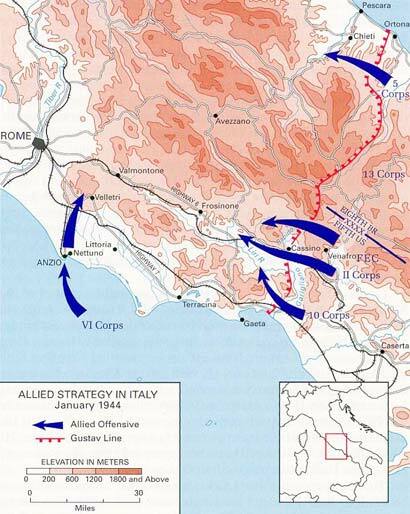 Having reached the Gustav Line, the Allies were perfectly aware that a frontal attack in the Abruzzi would be difficult. Churchill decided that an amphibious operation was needed above the Gustav Line, close to Rome, to be combined with an attempt to smash through the Gustav Line from the south. Once again he wished to use the pincer movement, in which he had so much faith. 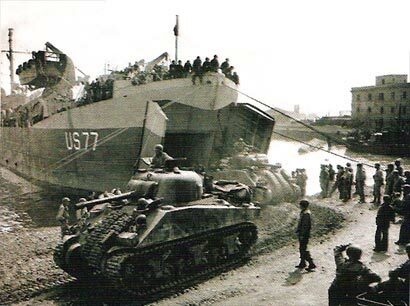 A little behind schedule, the Allies landed at Anzio on 22 January 1944. An attack to the north east of Cassino by the American 34th Division in collaboration with the C.E.F. Clark was encouraged by the taking of Monte Trocchio by the American 36th Infantry Division on 14 January 1944 and by the successes of the 2nd D.I.M. at Monte Pantano, the Mainarde and Monte Santa Croce. The offensive began on 17 January 1944. The British 56th and 5th Divisions managed to cross the Garigliano, but their advance was halted by a German counter-attack. The American 36th Division from Texas then launched an attack on Cassino on 20 January 1944 and attempted to cross the Rapido at San Angelo. This attempt became a massacre for the American army who suffered a crushing defeat at the hands of the German 104th Panzer Grenadiers and the 71st Artillery Regiment. 1,681 soldiers were put out of action (141 killed, 665 wounded and 875 reported missing). These losses shook American opinion and provoked an inquiry in Congress into Clark’s conduct. In the face of this defeat, after three days of fighting, Clark ordered Juin to take the Belvedere to the north east of Cassino on 23 January 1944. Clark had not accepted Juin’s idea to attack in the direction of Atina. Juin considered that this diversionary operation would be too small-scale and that it amounted to no more than a “flanking movement within gunshot range“. Juin was aware that the timeframe for the launch of the attack was extremely short and that the soldiers would have to make a long march in order to get to the location. Juin also realised that the taking of the Belvedere would involve fierce fighting in the mountains that would bleed his men dry. Monsabert was also perfectly aware of the sacrifice that his men would have to make. Take the Belvedere by force? Whose idea is that! Have they looked at it? First of all you have to cross two rivers, the Rapido and the Rio Secco, then drive through the Gustav Line without losing momentum in the valley, then penetrate Jerry lines and finally, in the heart of his defence system, scale seven hundred metres of rock as bare as a billiard ball, which is itself well-defended, and pounded on all sides by fire from the Cifalco and the surrounding heights, all held by the enemy! It’s madness! And then to attack up there in the morning of the 25th, when it’s now the evening of the 23rd and we are still here. How are we supposed to do that! Have they looked at the map? It will take us two whole days, at least, simply to make the move! It is quite a challenge, Sir! In spite of their reservations about this decision, which must have been taken at great speed and about whose strategic and human interest they had doubts, Juin and Monsabert were military men and executed Clark’s order. Clark’s diversionary manoeuvre was relatively simple: the French, Tunisians and Algerians were supposed to breach the Gustav Line, occupy the summits of the Belvedere and Casale Abate thus forcing the Germans to plug the breach. This diversion would facilitate the American offensive at Cassino. General de Monsabert chose the 4th R.T.T., led by Colonel Roux, to break through the Gustav Line. The 4th R.T.T. was to be supported by a squadron from the 7th African Armored Regiment led by Colonel van Ecke, a company of Shermans lent by Clark and six groups of artillery (two 105 mm guns and four 155 mm guns). The 4th R.T.T. might be reinforced by detachments from the 7th R.T.A. and the 3rd R.T.A. Two battalions of the 3rd R.T.A. were instructed to occupy the valley of the Rio Secco facing Belmonte. The armoured vehicles of the 3rd Algerian Spahis (Colonel Bonjour) were to establish a bank of artillery at a lower level facing the village of Cairo which was held by the Germans. Monsabert and Roux would also have air support. Although assigned in full to the American offensive at Cassino, two groups of planes were to bomb Olivella and the Belvedere approximately fifteen minutes before the French offensive. It is important to stress that the artillery played a determining role in the fighting. It provided uninterrupted support to the attacks of the infantry. Without it, it would have been impossible for the 3rd D.I.A. to take the Belvedere or break through the Gustav Line. Objectives assigned to the 4th R.T.T. Clark’s decision, taken with only 48 hours’ notice, meant that the men of the 3rd D.I.A. had to complete a march of nearly 24 hours in order to get to the zone of the Belvedere. At dawn on the first day of the fighting, the men launched an attack on the massif held by the Germans, having just walked a considerable distance across the mountains. In less than 24 hours, the Monsabert division (3rd D.I.A.) to whom Juin had entrusted the whole manœuvre, had to do a 90° turnaround, to spin round, remove from the north front elements in contact with the enemy, or even in combat, as at Carella, make them carry out a bypass movement behind the lines, with all their weapons, equipment, and baggage, and then have them launch an assault facing west. Colonel Roux chose the 3rd Bataillon led by Major Gandoet to take the positions at the Belvedere. Objective no. 2 (O2): to take hill 862. The 2nd Battalion (Berne) would support the action of the 3rd Battalion by making a diversion to the left. Objective no. 2 (O2): to take Casale Abate (hill 915 and hill 875). The 1st Battalion (Bacqué) would remain in reserve initially. Gandoet assigned the 3rd Battalion’s preliminary objective to the 9th Company (Captain Denée). Gandoet assigned the main offensive, i.e. objectives O1 and O2 to the 11th Company (Lieutenant Jordy). The capture of hill 862 would mean that the Gustav Line was broken. On 24 January 1944, the eve of the first day of fighting, Colonel Roux called a meeting of the commanding officers to study how the Belvedere might be taken and the Gustav Line broken. A few aerial photos had been taken and were analysed by the officers. At that date, the mules had not yet arrived at the battleground. The decision was taken to load the men with the ammunition and not bother with the food. This was to have serious consequences for the men, as not only were they heavily laden, but as priority had been given to the weapons, they also had to combat cold, hunger and thirst. 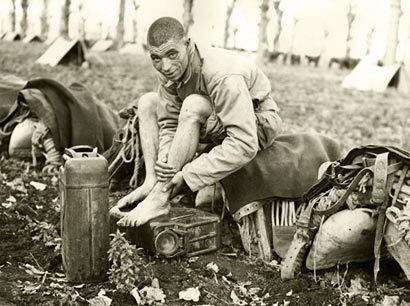 The men therefore had to carry all the equipment during the assaults: one pack of K-ration (one third of the daily ration), a can of water, a tent canvas, a blanket, the F.M., the maximum amount of ammunition for the F.M., machine guns, mortars, grenades. Colonel Roux’s H.Q. was to be the observation post on hill 502.